Originally, I was going to do this post about The Maltese Falcon, which deserves a spot on anybody's Best Movies List. And for the record, The Maltese Falcon really is on my list. But since I'm limiting myself to ten (in no particular order), I have to admit that I like Humphrey Bogart better in The African Queen. And it's not just because Charlie Allnut is a nicer guy. In a weird sort of way, my choice between the two movies (and the two characters) is like the difference between the dangerous kind of guy and the good guy. You're attracted to the dangerous guy, but in the end it's the good guy you end up marrying. Both movies have well-written stories and engaging plots. 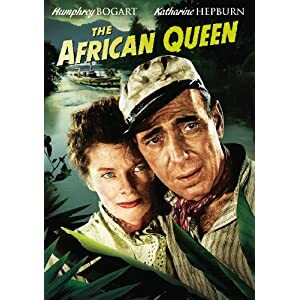 ButThe African Queen has one other bonus: Katherine Hepburn. While the Maltese Falcon is about one guy, Sam Spade, and his search for the truth, The African Queen is about two very different people whose lives intertwine so successfully, they're able to achieve the impossible (or at least the improbable). Charlie Allnut is a tugboat captain, an independent guy whose love of freedom has taken him to Africa, a place most Americans will never see. The political climate there is dangerous, so he has to be both smart and courageous to pursue that freedom. But he's also a down to-earth-guy, and when he meets Rose Sayer, he feels that they belong to different classes. And he's right. She is the sister of a missionary, and her goal is to help people find God. It's a goal that blows up right in her face, leaving her with ashes, but Charlie rescues her in more ways than one. Rose feels she has lost everything, but as she and Charlie get into that boat and go crashing down the river rapids into an uncertain future, she makes an observation that is my favorite quote from the whole movie: “I never dreamed any mere physical experience could be so stimulating!” She loves that trip down the rapids. She begins to develop an interest in the boat itself – and in the man who owns it. 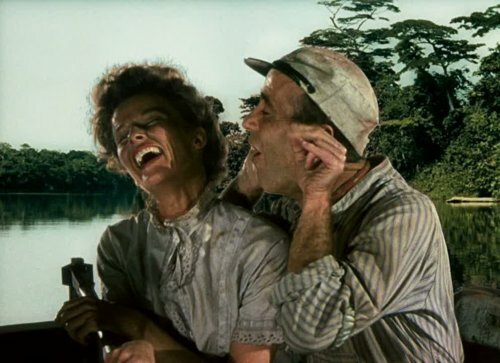 Katherine Hepburn wrote a wonderful diary about the making of the movie, The Making Of The African Queen. They filmed in Africa, and there were some issues with the water which Humphrey Bogart and John Huston seemed to have neatly avoided by spiking that water with a little whisky. The African Queen is an essential John Huston movie. Like the cast and crew, the characters are tested by hardships. How they rise to those challenges defines their character. The most charming moment in the film happens the morning after Charlie and Rose have obviously been intimate with each other (a moment handled with great sensitivity and discretion), and she says to him, “Dear – what is your first name?” This romance binds them together, but isn't the strongest thing doing so. That would be their mission, which is to blow up a German warship that has moored in the lake at the end of the tributary in which they are struggling. They may be going through Hell, but it's not High Water they're battling, it's low water, which threatens to strand the boat. But they refuse to give up, even when things look hopeless. With equal parts humor and tragedy, their struggle is engrossing. The resolution of their story is both gratifying and believable. No superheroes save the day, no wizards throw magic bolts of lightning at each other. Instead, two people refuse to give up – and they triumph. That's why The African Queen makes the top ten, with no reservations whatsoever.